Soup is a warm hug for the stomach. It makes you feel better when you’re sick, warms you up when you’re cold, and comforts you when you’re feeling down. From chicken noodle to tomato bisque, soup is good for the soul. It can be enjoyed as an appetizer, a full meal, or a mid-day stomach filler. It’s one food that will never go out of style. Here are the best soup places in Nebraska. If you’re looking for authentic Vietnamese taste and cuisine, visit Noodle Soup for a bowl of pho or dumplings. According to the website, traditional Vietnamese pho is the ultimate comfort food and cure all, similar to chicken noodle soup. The menu is simple and affordable; eating there is sure to become a weeknight tradition. Schlotzsky’s offers a plethora of soup flavors, starting with a bistro French onion and ending with chicken and wild rice. No matter what mood you’re in, a sassy, spicy one—try the chicken tortilla—or a sad, homesick one—the loaded baked potato might be a good choice there’s a soup to match the feeling and atmosphere. As the website says, “Grab a seat. Grab a soup bowl. Grab a spoon.” And sit down. This deli is primarily a sandwich seller, but as a side, customers can order a cup or a bowl of homemade soup. Enjoy a soup to dip a delectable sandwich in—something with melted cheese, surely—or eat the sandwich at the deli and bring the soup home for later. Sometimes soup can be a perfect late-night snack, especially during the winter time. If chicken noodle isn’t your bag or you’re just plain sick of regular old tomato, eat out at the Oven, which specializes in Northern Indian Cuisine. There are actually four locations throughout Nebraska, so no matter where you reside, there’s sure to be an Oven within driving distance. They serve Mulligatawny Soup, a traditional Indian soup with pureed lentils, flavored spices and garnished with rice and fresh cilantro. Choose from a cup of soup, a bowl of soup, a bread bowl, or two other specialties—a signature cup or bowl of soup. 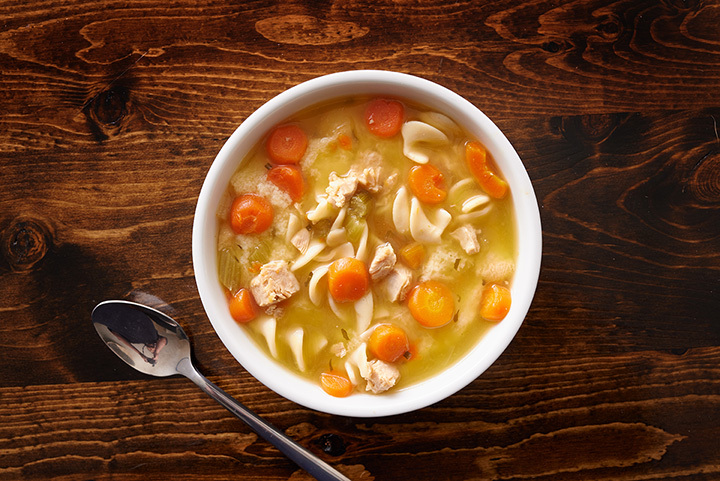 Paradise Bakery & Cafe serves different soup flavors daily at all three of their locations— Nebraska, Texas, and Utah. Having been in business since 1976, Paradise has perfected their soup recipes. The Keeping Room dubs itself on its website, “A fusion of stylish antiques, home decor, unique fashion, fabulous food, drink, and a friendly atmosphere.” Honestly what more could a customer want? The Room offers a Soup of the Day along with other daily specials. Go there to shop, end up sipping soup. The Alley Rose claims to be as unique as its name—somewhat of a juxtaposition of a dingy alley and an elegant rose. On the menu, every entree comes with a side of soup prepared by the Rose’s meticulous kitchen staff along with one other side of the diner’s choice. Simply Delicious offers a dining experience quite unlike any other. Having first owned a pastry cafe, Wendy Deane transitioned into the restaurant business. But with not just a restaurant, she also offers an art gallery and loft to be toured as well as a shop to browse in. Simply Delicious boasts a tomato basil soup and a seafood bisque. Right away the staff and owners of Backalley Bakery let you know who they are, they are “bread people.” So, while you enjoy the soup du jour sample their fresh artisan bread. Perhaps some cheesy garlic for dipping or some cranberry pecan for dessert. The Bakery is more of a lunchtime destination, so maybe after a long morning’s shopping stop in for a quick bowl of bisque. If Noodle Soup didn’t cut it for you, there’s always the Pho Factory. According to its website, Pho Factory’s concept is “to provide our community with quality, delicious, healthy, yet affordable Vietnamese dishes, while providing superior service in an atmosphere that is clean, warm contemporary and a hint of Asian rustic.” If that sounds like some where you’d like to slurp some soup, try their Spicy Hue Noodle Soup, the Hu Tieu Soup, or the Wonton Soup.